Pace University School of Law's Women's Justice Center's "The Friends of Gail," Executive Board Member, 2007 - Present. In Weiss v Tri-State Consumer Ins. Co., 98 AD3d 1107 (2d Dep't 2016), the Second Department reversed its earlier precedent and held that SUM insurance coverage should not be offset by payments from a non-motor vehicle bodily injury insurance policy. In Palydowycz v Palydowycz, 138 AD3d 810 (2d Dep't 2016), the Appellate Division, Second Department, held that the husband's medical practices hold a value, distinct from the income stream that the medical practices generated. As a result, the wife was entitled to maintenance based on the income stream from the practices in addition to a share of the value of the medical practices themselves. This ruling constituted a departure from the Second Department's earlier decisions on this issue. In Auqui v. Seven Thirty One Limited Partnership, 22 N.Y.3d 246 (2013), Ms. Hasapidis represented a worker who was injured when a sheet of plywood fell from a 50-story- high construction site and struck him on the head as he walked down a New York City street. On February 14, 2013, the Court of Appeals, for the first time, granted collateral estoppel effect to Decisions of the workers' compensation board in third-party actions regarding disability issues. The Decision jeopardized the right to a jury trial on those issues and would have a serious impact on the ability of injured workers to seek justice through the court system, while also undermining the workers' compensation system. 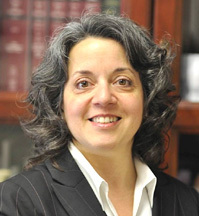 Ms. Hasapidis requested that the Court of Appeals grant reargument of its Decision and Order, which is rarely granted. Yet, the Court granted reargument and, after a second round of briefing and oral argument, the Court unanimously vacated the earlier Decision, and held that a determination of the workers' compensation board as to duration of disability could not be granted preclusive effect. AV*-Rated by Martindale-Hubbell's Law Directory. *An AV® certification mark is a significant rating accomplishment - a testament to the fact that a lawyer's peers rank him or her at the highest level of professional excellence. For further information about some of her past results, see her Representative Case Summaries.